Discussion in 'General Bushcraft Discussion' started by Stone, Apr 6, 2019. I just recently passed 20K likes and I am doing a @DavidJAFO style giveaway. Y'all can say you are in if you wish, but @CaptainAiryca is the winner. I will be assembling the stash over the next week and getting it in the mail to her by around Income Tax Day. Not familiar with a @DavidJAFO style giveaway? That's the kind David over in Scotland does. He finds someone he wants to gift and announces a giveaway at the same time he announces the winner. In this case, I used my "Random Predestination" generator. Prizes will be displayed before I mail them. Congratulations to Captain Airyca, and better luck next time to the rest of you that were considered. aaronu, bacpacjac, chndlr04 and 36 others like this. Congrats! I'm in. Better luck to me next time. superpaco, bacpacjac, Huey and 13 others like this. Morning Crow & I are in! bacpacjac, Holtzcraft, MrFixIt and 9 others like this. Due to the lack of entries I think I got a shot at this one so I am in. Hahaha Congratulations Captain Airyca. Intrigued to see what goodies will be had! bacpacjac, Primordial, Holtzcraft and 10 others like this. bacpacjac, Holtzcraft, MrFixIt and 8 others like this. Congratulations @Captain Airyca and thank you for the GAW. I'm in! bacpacjac, Holtzcraft, MrFixIt and 7 others like this. I am in for @Captain Airyca if that is ok with you? bacpacjac, beacon, Primordial and 15 others like this. Im in...but if I win please forward the prize to @Captain Airyca . bacpacjac, Holtzcraft, MrFixIt and 10 others like this. @Stone Thank you so much!! I really appreciate being chosen! Might have to do a giveaway like that someday too. Congratulations on 20k likes, that's something to be proud of!! bacpacjac, piney, Primordial and 13 others like this. Wow, that means Captain Airyca is up to four chances now! She's got this one. OK, y'all. I'm letting this run until I get the goods mailed off...then I'm buttoning it up. bacpacjac, Holtzcraft, MrFixIt and 6 others like this. bacpacjac, Holtzcraft, Stone and 6 others like this. @Captain Airyca you got this one in the bag! Congrats! bacpacjac, Holtzcraft, Stone and 5 others like this. @Stone congratulations on the 20,000 likes licks (again) & @Captain Airyca on the GAW. bacpacjac, Captain Airyca, Holtzcraft and 3 others like this. bacpacjac, Captain Airyca, Holtzcraft and 4 others like this. Congratulations on the milestone brother! bacpacjac, Captain Airyca, Holtzcraft and 2 others like this. bacpacjac, MrFixIt, Captain Airyca and 1 other person like this. I am in for @gohammergo who is in for @Captain Airyca ! Awesome idea! bacpacjac, MrFixIt, Captain Airyca and 3 others like this. Oh well, congrats to the winner and very generous of you to host the giveaway! bacpacjac, MrFixIt, Captain Airyca and 2 others like this. Congrats, I would like to be in! bacpacjac and Captain Airyca like this. Thank you @Stone for the generous giveaway! Thank you for choosing me as the random predestination. Check it out everyone! 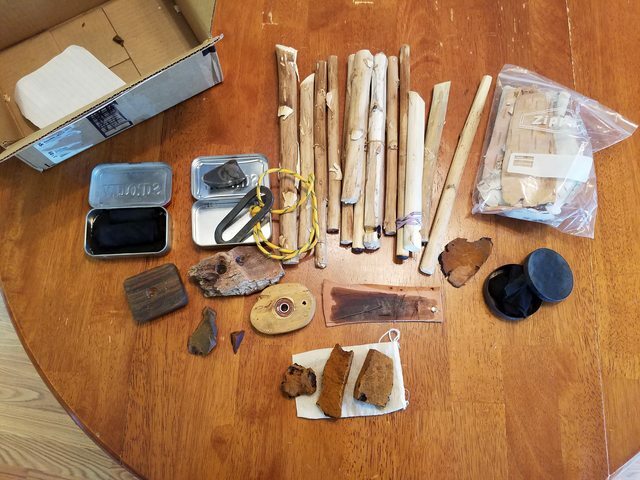 You know you're a bushcrafter when you get a box with sticks and rocks and are super excited!! Seriously, Thank you so much!! So as you can see I have a lot of fire making in my future. flint and steel, yucca, chaga, birch bark, bearing blocks, spindles, hearth boards, char cloths, tins, so many goodies!!! Let's get LIT! bacpacjac, BushcrafterAU, MrFixIt and 8 others like this. Awesome win! Take pics when you play with the new toys! bacpacjac, MrFixIt, Stone and 1 other person like this. That's funny stuff. My wife used to raise her eyebrows when she would see me packing up a box of birch bark to send to someone. Or when I would get a box of fatwood. "Why are you getting boxes of sticks in the mail?" Now, no one bats an eye when a package comes in. bacpacjac, BushcrafterAU, Captain Airyca and 2 others like this. My wife used to think I was nuts for getting excited over a box of fatwood. Once she used it for herself, she understood. Now I have to hide my fatwood from her. bacpacjac, BushcrafterAU, Captain Airyca and 3 others like this. Stone, bacpacjac and BushcrafterAU like this. Captain Airyca and Stone like this. This is a real thing for some of us. I had a fair sized bag of fatwood hidden in the bedroom. One satuSatu morning I went to get some to get a fire going. Over half of it was gone! I thought I had grabbed the wrong bag, and my wife saw me looking around and she told me she has been using it. Said it works really good too. Looks like you got a grownup Easter basket!